Late 16th century boxwood carving of St Joseph, Flemish - Antwerp, circa 1580 - 1600. The highly patinated figure of St Joseph with the Christ child carrying a basket. Provenance: From the collection of Sam Wolsey, dealer in early English furniture & works of art. Co author of “The Age of the Joiner”, Wolsey & Luff. The small Boxwood group is well rubbed and highly patinated, with the loss of forearm on the Saint and child, other missing detailing to the base. 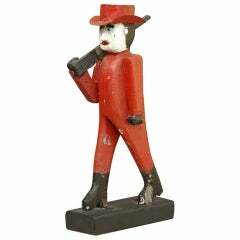 Hand-carved wooden Folk Art hunter with a sheet metal hat. Original red, white and black paint surface.